Wow…what a journey! I can’t believe we’re here celebrating the life of Momma Pope. But what a life it was. For those of you don’t know me, I’m Maryanne Pope – Mary’s daughter. On behalf of our family, I’d like to thank everyone for coming today to share in this celebration of our mom’s life. It means a lot to us and it means a lot to her, too…so thank you. Thank you also to Reverend Fergus Tyson for officiating this service. 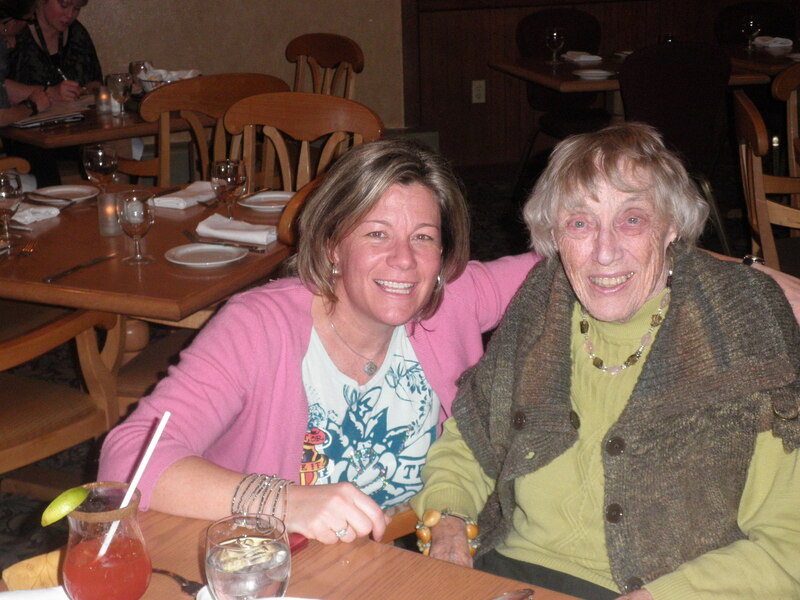 Our mom spoke very highly of you – and after working with the past few days, now I know why. Thanks also to the McGinnis & Holloway for all your help and professionalism over this past week…you have made a very difficult time a bit easier. Well, that baby made it through the night all right…and it’s a perfect example of the sheer strength of spirit our mother had right from the get-go. She was a survivor. She was born a fighter – and she stayed a fighter her entire life…right up until the very end. As many of you know, my mother was one tough cookie. Yes, she was kind, generous, compassionate, had a wonderful sense of humour and loved to have lots of fun. But at her core, she was a very strong soul who, I suspect, had a specific job to do here…and she did it. And that job was to be our mother. Perhaps it’s not a coincidence that my mom loved animals so much, especially cats. For if there was an animal that best represented our mother, it would be the tiger. Because when it came to us kids, whether we were 4 or 40, you did not want to get between Momma Pope and her cubs. On that note, a tribute to my mother wouldn’t be complete if I didn’t mention one of the greatest thorns in her side – my late husband, John. My brother Doug reminded me the other day of a very telling John & Momma Pope story that sheds light on what my mom was all about. Doug and mom had just had a spectacular fight over something or other – and he was dropping her off at my and John’s place for some reason. Our mother did her job of raising four amazing children who went on to share their lives with equally amazing partners and raise 5 fantastic grandkids…and grand-dogs and grand-cats, as the case may be. And boy, did she ever love her grandchildren…she was so proud of you all: Kylie, Melanie, Laura, Kim and Emily. Our mother cared far less about what we did with our lives than how we lived them. And although she had a very successful career as an RN and was an extremely savvy investor, she understood that material success means little if you don’t have empathy, kindness and compassion for others. And, just like a tiger, Momma Pope taught us how to survive in the world. She taught us independence, strength and resilience. She taught us that although life isn’t always fair, being fair is always important. She taught us how to love and how to laugh – and to never stop learning. And although her sharp tongue and Irish temper got her into trouble more often than not, she always had the courage to speak her mind. And because of this, she taught us to stand up for what we believe in. I think we were all in constant awe at her sheer relentlessness. But I realize now that if I didn’t have the mother I did, I wouldn’t have the strength, courage or determination to take the path I am taking. Being Momma Pope’s daughter was the equivalent of 46 years of tough-love boot camp – and her training is paying off in spades. But my mom also knew how to have fun! She loved to throw a few things in the picnic basket and head to the mountains. My love of the outdoors and respect for nature came from her. She took me and Kim to Churchill to see the polar bears. She’d been all over Canada and the States. She went to Mexico, Cuba, Ireland…London, Paris, China. 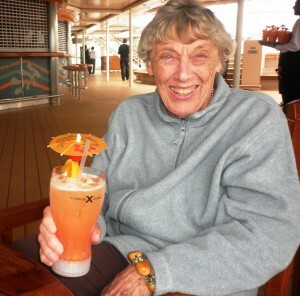 At 86, we all went on a cruise to Alaska. She flew in a helicopter over the Grand Canyon. 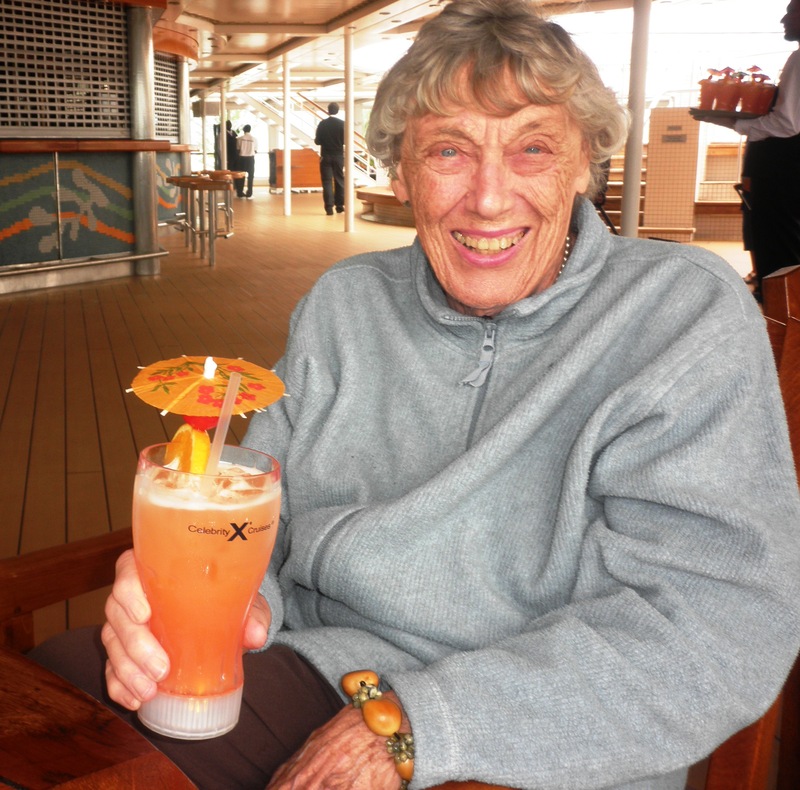 She played the slots in Vegas, drank Manhattans in New York and Mai Tai’s in Hawaii. And when her health started slowing her down, she adapted. She loved to read, go to the theatre, keep up on current events and have heated discussions about the issues of the day. There is another quote by Churchill that fits our mom beautifully: “Never, ever give up.” Momma Pope never gave up. She was fully aware of the risks that came with hip replacement surgery. But she still chose to have it because the pain in her hip was excruciating. She made the conscious decision to take the chance of improving her quality of life. In the end, she paid the price with her life. But perhaps there is a tremendous lesson in that for all of us: for I, too, would rather take a calculated risk to improve the quality of my life than continue to live in pain because of fear. Family was everything to our mom. Her greatest fear was not of dying. Her greatest fear was that when she died, her family would drift apart. But I know for a fact that won’t happen…partly because of the bonds we had to forge over the years dealing with Momma Pope’s shenanigans – and partly because, as this past week has reinforced, we are far stronger as a team working together than we are as individuals. I’m beginning to suspect that my mom knew exactly what she was doing all along…or rather, her soul did. And when she had finished the job she came here to do, she pulled a fast one on us and snuck out the back door in that tiny window of time when no one was around. The time had come for her to move on to the next leg of her journey. And although our mom would have loved another decade here on earth – and we were all rooting for that – that was not meant to be. That’s the end of my formal tribute. But I’m going to pull a classic Momma Pope move and give a few of what we call in our family: “add-ons.” Whenever my mom said grace, she never ended with the prayer. Before saying Amen, she always had to add a few extra directions to the Powers That Be…whether it was to look out for the polar bears or the refugees in Syria or whoever in her life needed a little extra love sent their way. And thanks also to you, Dolly, for all your help with mom over the years. And a special thank goes to Dr. Bensler, who was our mom’s family doctor for years. You sure had your work cut out for you with Momma Pope as your patient…but you did your job well, keeping her upright as long as you did. So thank you. Tracey (my sister-in-law/Doug’s wife), Donna and Mary (my sister-in-law/Pat’s partner): I want to thank you for living – day in and day out – what my mom sometimes had a heck of a time trying to teach through her own actions. Her motto in life was to treat others as you would like to be treated yourself. But as we all know, this is not easy to do. Thankfully, it’s a skill all of you have…that – and an incredible ability to turn the other cheek. So boy oh boy, was our mother ever lucky to have had you for daughter-in-laws! And the final add-on goes to my brothers: Pat, Doug, George and my little half-brother, Carleton – who’s not so little anymore – and to my Dad. When I had my rather spectacular meltdown on Doug’s shoulder earlier this week, what came to the surface after all the sobs surprised me: it was fear. Here is the link to Mary’s obituary. I was terribly sorry to learn that your extraordinary (and beautiful, like you) Momma Pope passed away — the eulogy you spoke at her service and also her obituary are terrific tributes to such a spirited soul. Losing your mother is like losing one of your senses; a mother’s laugh, smells, voice, advice, and so very much more that have been with you your entire life long are part of your very essence. When my own mother passed away (16 years ago), I missed our daily phone calls terribly. Gradually I adjusted, and so very often I will catch a whiff of some perfume or hear a familiar laugh across a busy restaurant or whatever, and I know she is always with me. The same will surely be true for you. So sorry for your loss, Maryanne, but also so happy to know of your strong family bonds (thanks to Momma Pope’s soulful lessons). MA I am so so sorry to get the news about your mom! After reading the absolutely amazing tribute you wrote for her, I am kicking myself for never taking the opportunity to meet her!! What a woman…and what a legacy she has left. The love and respect you have for her – while acknowledging all of her strengths and weaknesses – are everything a parent could hope for. I know she must have been incredibly proud of you. You do her credit – John was absolutely right. Thinking of you and sending love and hugs. Lying in a hostel in Australia, I just read your WWOW. As always, I’m encouraged, inspired and honoured. You are a mighty woman and after reading your tribute, I better understand where some of that comes from. Be blessed Pope family. I am in shock to be reading this tribute today. She was such a fighter and it just seemed that she’d be around forever. I really enjoyed meeting her and having conversations over the years. I’m so thankful for the time that you were able to spend with her a few months ago. She sure did raise some terrific kids. You are a bright ray of sunshine and lovely angel. My hugs and prayers are with you and your family. What a beautiful tribute to your firey and unstoppable Momma Pope. 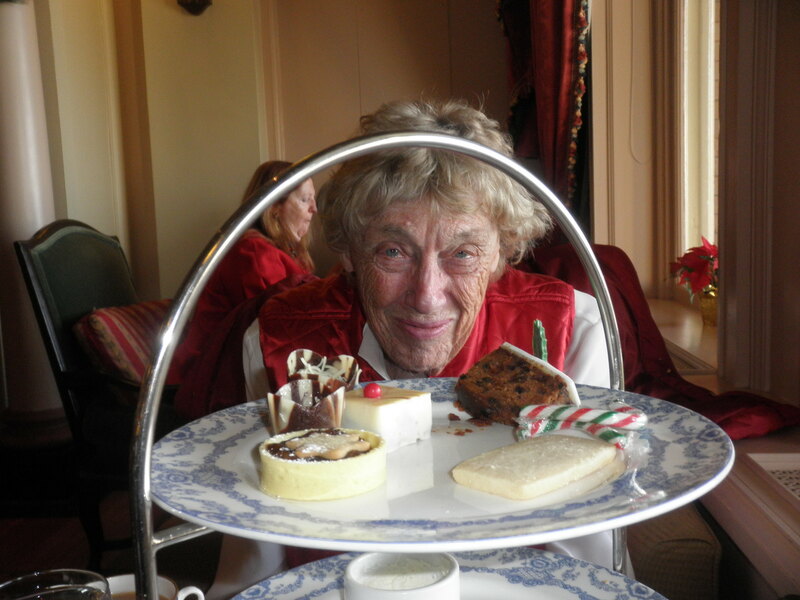 I am so very grateful to have spent some time with her at the Kingfisher Spa and Resort in Courtenay a couple of years ago. I watched her down a giant alcoholic beverage in seconds, smack her lips in delight, and become rowdier and funnier as the evening progressed. And I loved how she ordered dessert and savoured every bit of it! The funniest part was when you were wheeling her back to your room in her wheelchair and she jokingly accused you of trying to dump her into the ocean. I think the Irish and us Jews are sibling clans…I GOT your mother upon meeting her and delighted in her sharp wit, love of others and the world around her, and even her “bite”. I laughed so hard that night my stomach ached. I am so sorry for you and your family that you lost her earlier and more suddenly than hoped for or expected. My thoughts and prayers are with you all. Maryanne what a very special tribute. My mom is very strong woman and says her mind too. Dutch, People at the long term care centre don’t quite understand, but I do. She wants the best for dad. And not everyone is as detailed and out spoken as my mom. I had to smile. All my best, thinking about you at this time. Such a beautiful heartfelt tribute! She will be missed! Cherish the memories, always! From our entire Christos family, our deepest and most sincere condolences for the loss of your mother, best friend and pillar! Our thoughts and prayers are with you during this very difficult time! Maryanne, sorry to read of your loss – but what a wonderful tribute to your mother. Hey Pope… It’s been a while and I got this email today. So sorry for your loss. Your mom was a great lady, and you’re a wholelot like her. Oh my God Pope. Amazing tribute! Momma Pope is up there proud as a peacock.